This is the 7th Construction Phase Monthly EM&A Report for the Project which summarizes the monitoring results and audit findings of the EM&A programme during the reporting period from 1 July 2016 to 31 July 2016. The key construction activities of the Project carried out in the reporting month were related to Contract P560(R) Aviation Fuel Pipeline Diversion Works (Contract P560(R)) which involved installation of horizontal directional drilling (HDD) casing, drilling of HDD pilot hole and stockpiling of excavated materials from HDD operation. Site investigation works were also carried out to support design process. The monthly EM&A programme was undertaken in accordance with the Updated EM&A Manual of the Project. 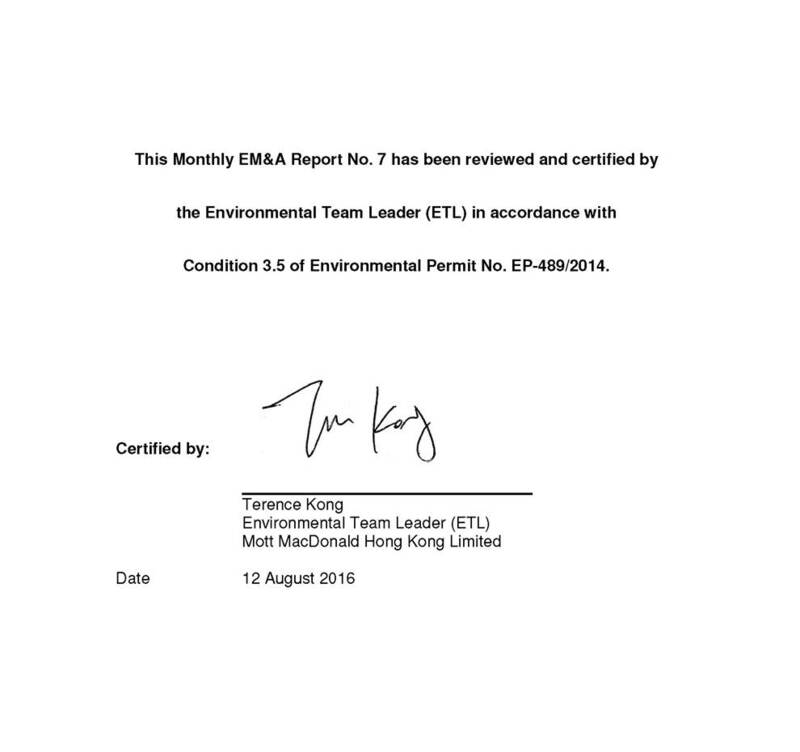 During the reporting period, the ET conducted thirty sets of air quality measurements, twenty sets of construction noise measurements, as well as four environmental site inspections, landscape & visual and waste monitoring for the Project’s construction works. 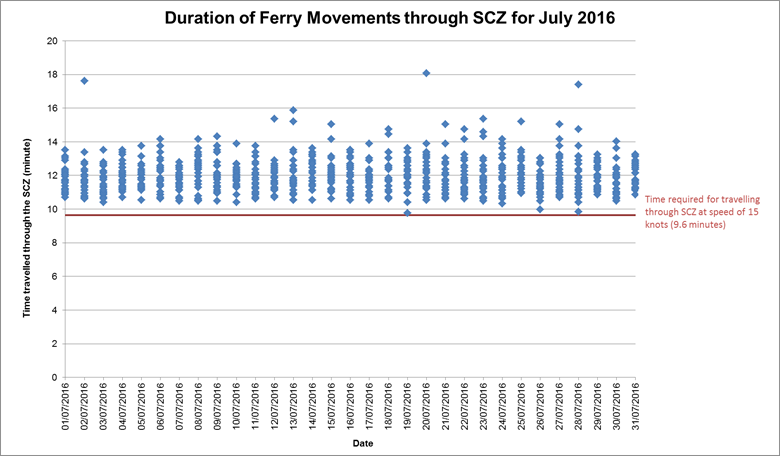 On the implementation of the SkyPier Plan, the daily movements of all SkyPier HSFs in July 2016 were within the maximum daily cap number. A total of 836 HSF movements under SkyPier Plan were recorded. All HSFs had travelled through the SCZ with prevailing speed under 15 knots (8.0 to 14.8 knots) in compliance with the SkyPier Plan. Seven ferry movements were not strictly following the diverted route. In summary, the ET and IEC have audited the HSF movements against the SkyPier Plan and conducted follow up investigation or actions accordingly. ￭ Site clearance and construction work at Sha Chau. Site investigation works will continuous to carry out to support design process. Deep Cement Mixing (DCM) works contracts will be awarded in August 2016. The key environmental issues will be associated with dust and noise generation and construction waste management. The impact water quality and Chinese White Dolphin (CWD) monitoring, and ecological monitoring at Sha Chau will be commenced in August 2016. The implementation of required mitigation measures by the Contractor will be monitored by the ET. ￭ Baseline monitoring of CWD by passive acoustic monitoring (PAM) has been completed in July 2016. The initial reclamation works will commence on 1 August 2016. The overall phasing programme of all construction works has been updated and is presented in Appendix A. This is the 7th Construction Phase Monthly EM&A Report for the Project which summarizes the key findings of the EM&A programme during the reporting period from 1 to 31 July 2016. During the reporting period, key construction activities of the Project were related to the Contract P560(R) Aviation Fuel Pipeline Diversion Works (Contract P560(R)) which involved installation of horizontal directional drilling (HDD) casing and drilling of HDD pilot hole at the HDD launching site located at the west part of the airport. The HDD launching site and stockpiling area are around 3 km and 900m away respectively from the nearest air and noise sensitive receivers in Tung Chung and the villages in North Lantau. The locations of the Contract P560(R) works areas are presented in Figure 1. Site investigation works were carried out to support design process. The baseline water quality monitoring result has been reported in Water Quality Baseline Monitoring Report and submitted to EPD on 15 July 2016 under EP Condition 3.4. Baseline monitoring of CWD by passive acoustic monitoring (PAM) has been completed in July 2016. The baseline CWD result has been reported in CWD Baseline Monitoring Report and submitted to EPD on 15 July 2016 under EP Condition 3.4. The CWD Baseline Monitoring Report has been approved by EPD on 25 July 2016. In accordance with the Updated EM&A Manual, baseline 1-hour total suspended particulate (TSP) levels at the two air quality monitoring stations were established as presented in the Baseline Monitoring Report (Version 1 dated December 2015). Impact 1-hour TSP monitoring was conducted for three times every 6 days. The Action and Limit Levels of the air quality monitoring are provided in Table 2.2. The air quality monitoring schedule involved in the reporting period is provided in Appendix D.
Weekly monitoring of the Project construction works was carried out by the ET on 6, 14, 20 and 27 July 2016 to check and monitor the implementation of proper waste management practices during the construction phase. 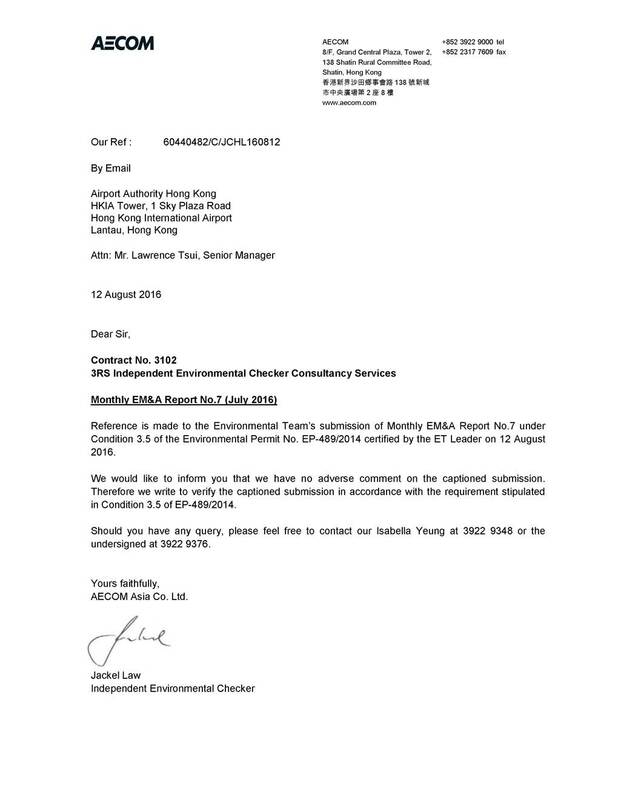 For Contract P560(R) Aviation Fuel Pipeline Diversion Works, recommendations were provided during monitoring including proper plugging of drip tray to avoid any leakage on 6 July 2016, replacement/ repair of broken drip tray on 20 July 2016. The contractor had followed up with implementation of mitigation measures. Based on the updated information, about 284 m3 excavated materials were produced from the HDD launching site in July 2016. The generated excavated materials were temporarily stored at storage and stockpiling area at Chun Ming Road adjacent to Tradeport Logistic Centre on the airport island. The excavated material will be reused in the Project. In addition, metals, paper and plastic were recycled during the reporting month. 1.2 tonnes of general refuse were disposed of to the West New Territories (WENT) Landfill in July 2016. No Construction and Demolition (C&D) material was disposed off-site during the reporting month. No exceedances of the Action and Limit Levels were recorded in the reporting period. Weekly site inspection of the construction works was carried out by the ET on 6, 14, 20 and 27 July 2016 to monitor the implementation of proper environmental pollution control and mitigation measures for the Project. Site inspections were also conducted independently by the Project’s Independent Environmental Checker (IEC) on 8 and 20 July 2016. Observations have been recorded in the site inspection checklists and passed to the Contractor together with the appropriate recommended mitigation measures where necessary. The key observations from site inspection and associated recommendations were related to the improvement of efficiency of wastewater treatment facilities, proper maintenance of drip tray and provision of wheel washing before leaving the construction site. In addition, CNP compliance check of the use of powered mechanical equipment during restricted hour was carried out by the ET on 11 July 2016. The use of powered mechanical equipment was complied with the requirements of CNP. Key audit findings for the SkyPier HSFs travelling to/from Zhuhai and Macau against the requirements of the SkyPier Plan during the reporting period are summarized in Table 5.1. The daily movements of all SkyPier HSFs in July 2016 were within the maximum daily cap number. Status of compliance with annual daily average of 99 movements will be further reviewed in the annual EM&A Report. In total, 836 ferry movements between HKIA SkyPier and Zhuhai / Macau were recorded in July 2016 and the data are presented in Appendix H. The time spent for the SkyPier HSFs travelled through the SCZ in July were presented in Figure 5-1. It will take 9.6 minutes to travel through the SCZ when the SkyPier HSFs adopt the maximum allowed speed of 15-knot within the SCZ. Figure 5-1 shows that all the SkyPier HSFs spent more than 9.6 minutes to travel through the SCZ. ￭ Case on 1, 8, 9, 11, 12 and 15 July 2016: HSF captains reported that the deviations of routing were due to strong tidal current. Ferry operators were requested to provide further supporting evidence as justification. Follow up action will be taken if valid reasons / supporting evidence cannot be provided. ￭ Case on 22 July 2016: This case is under investigation. Another deviation case of not strictly following the diverted route on 21 June 2016 has been followed up. Investigation found that the vessel captain required to give way to floating obstructions including buoy, marine refuse and bamboo raft for safety reason. After that, the HSF returned to the normal route following the SkyPier Plan. All HSFs were within 15 knots (8.0 knots to 14.8 knots), which complied with the SkyPier Plan. The time used by HSF to travel through SCZ is presented in Figure 5-1. ￭ Management of chemicals and avoidance of oil spillage on-site. The impact water quality and CWD monitoring, and ecological monitoring at Sha Chau will be commenced in August 2016. The implementation of required mitigation measures by the Contractor will be monitored by the ET. The impact water quality and CWD monitoring will be commenced on 1 August 2016. A tentative schedule of the planned environmental monitoring work in the next reporting period is provided in Appendix D.
The key construction activities of the Project carried out in the reporting month were related to the Contract P560 Aviation Fuel Pipeline Diversion which involved installation of HDD casing, drilling of HDD pilot hole and stockpiling of excavated materials from HDD operation. Dust suppression measures including wheeling washing, watering and covering of excavated materials and establishment of site hoarding have been implemented.